Climate change is here, in the form of wildfires ravaging around the state and hazardous air quality where the smoke drifts. To locate where fires are burning, visit the CAL FIRE website. It’s vital to protect your health now and into next week, and to prepare for this phenomenon to happen repeatedly in the future. Below are key resources and information to keep you safe and healthy in challenging times. For information regarding air pollution in your area, visit the AirNow website or PurpleAir.com if the EPA page fails to load from too much traffic. Smoke from northern wildfires is flowing into the Bay Area, polluting our air with increasing levels of particulate matter. Our air is currently exposed to “very unhealthy” levels of particulate matter that is 2.5 microns or smaller in size (PM2.5). These particulates are significantly smaller than a fraction of a human hair. Inhaling PM2.5 is harmful to your health. The smaller particles can get into the deepest portions of the lungs, where gas exchange occurs between the air and your blood stream. At that deep level, the lungs have no efficient means of removing the tiny particles, and they can pass into the bloodstream within minutes or stay in the lungs for a long time. Particulate matter that enters the lungs and blood can increase your risk of heart attack, pneumonia, lung diseases, and more. The Spare the Air website is a good source for details on the health effects of inhaling PM2.5. To minimize your exposure to dangerous particulates, stay indoors. If you are homeless or don’t have access to indoor space, Alameda County has identified a list of locations in each city where people can seek shelter from outside. If you do have access to indoor space, follow these tips to keep the indoor air quality as good as possible. Keep all windows and doors closed. Use an air purifier – specifically one that can filter out particles that are 0.25 microns or smaller. You can 1) buy a portable air purifier for single room air filtration, 2) use a filter in your forced-air furnace (if you have one) to clean air in multiple rooms at once, or 3) create your own air purifier system using online tutorials, such as this “Do-It-Yourself Home Air Purifier” by the University of Michigan. 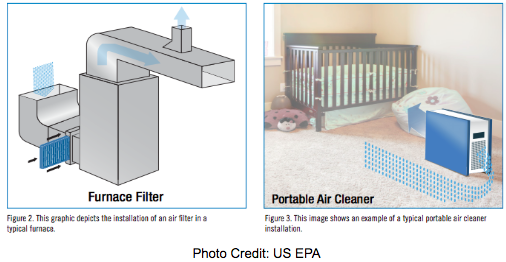 Visit the CalEPA or US EPA website for more information on effective air filtration. The outdoor air may appear hazy, but you may not feel the immediate health effects of breathing it. But protection is essential: what you are breathing in can impact you in the future. Don’t take any risks! To protect yourself when outdoors the CA Department of Public Health recommends using N95 or P100 face masks. N95 blocks 95% of particles 0.3 microns or larger. P100 blocks 99.97% of particles 0.3 microns or larger. For these masks to be effective, you must wear them properly, as described in this tutorial. They can be purchased at hardware stores, medical supply stores, paint stores, and online. Vogmasks are increasingly popular, but are not yet approved by the National Institute for Occupational Safety (NIOSH). N95 or P100 respirators can help to filter out particles, but they do not remove the irritating chemicals contained in smoke. For more info, check out the EPA’s Wildfire Smoke Guide for Public Health Officials. This entry was posted in Blog, Featured by Lynea Baudino. Bookmark the permalink.